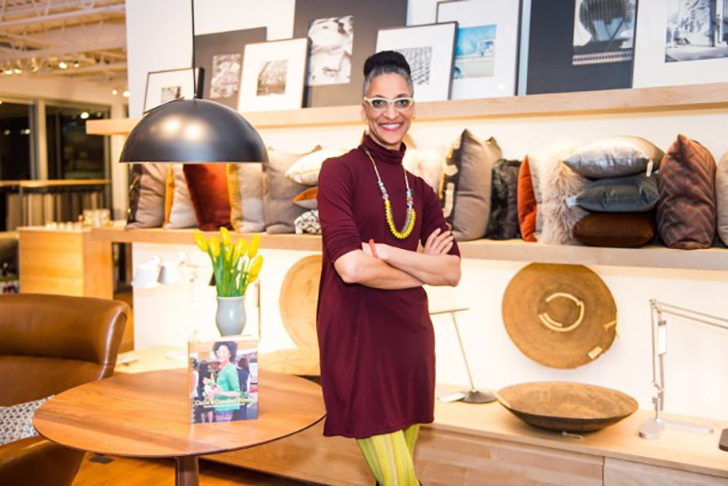 Carla Hall, two-time Top Chef finalist and co-host of The Chew, visited our Washington, D.C., showroom last week. Weaving the theme of connection and commonality among people, Carla spoke to an audience of nearly 350 about essential recipes—like chicken in sauce—that, with the addition of varying ingredients, have a Moroccan, French or Southern twist. Carla spent much of the evening connecting with fans, exchanging stories and signing copies of her two books, Cooking with Love: Comfort Food That Hugs You and Carla’s Comfort Foods: Favorite Dishes from Around the World. We took the opportunity to ask the beloved chef 10 questions. What food brings you comfort? Soup and cornbread. Mainly because the soup is hot and the cornbread has such great texture. And because I like bread with anything! The combination reminds me of grilled cheese and tomato soup when you are a kid. How would you say your approach to food is influenced by your Nashville roots? The influence of my Nashville roots comes from Sunday suppers at my grandmother’s house. I was actually much older when I started to really appreciate the food—even after Top Chef. When I was catering, people would refer to me as a “Southern chef” which rankled me because I thought I was being pigeonholed. When I had to do dishes on Top Chef, I automatically went back and drew on my roots. It was the fans that made me see how much I appreciate my heritage, and that it’s an important thing to showcase in my food. What three words best describe your home decor style? My living room/den because that is where Matthew and I watch television and have casual meals. My co-hosts on The Chew. I see them every day and they are always doing fantastic things. I’m usually standing there watching in wonder. The other day Michael made crab cakes bound with egg whites instead of bread crumbs and used panko breadcrumbs for texture. It was amazing. I’m always learning from them. What is your favorite go-to meal? What tips do you give when cooking for dinner guests? Keep it simple. Make something you have made before, and something that is not going to keep you in the kitchen. What’s your most prized kitchen tool? One thing you always have in your fridge or pantry? Four different kinds of mustard: Dijon, grain, brown and yellow. In a snowball fight, which The Chew co-host would you want on your team? Daphne. Because Daphne is NOT going to lose.